RMC4 was one of the pre-production prototype Routemasters built in 1957. Coach versions differed from the standard bus in having rear air-suspension, semi-automatic transmission, luggage racks, fluorescent lighting, platform doors and more comfortable seating. RMC4 spent some time operating from Stevenage on the 716 service, both in its prototype guise and subsequently after modification to standard specification. It is seen at Stevenage Garage open day for the Green Line Golden Jubilee, 1981. It retired from active service in 1979, but has been a cherished member of the fleet of LCBS, London and Country, and latterly of Arriva, ever since. 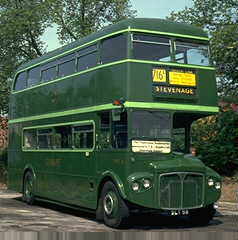 Routemaster production ran from 1958 until 1968. Three batches of vehicles went into country area service - Coaches RMC1453-1520 - the first 'stretched' variety, Coaches RCL2218-2260 - and 'stretched' buses RML2306-2355,2411-60. Routemaster coaches replaced the limited-capacity RF single-deckers, particularly on routes to the burgeoning New Towns, and batches of RTs on intensive routes from Aldgate. They were replaced in turn by Reliance single-deck coaches when double-manning became prohibitive, and were cascaded onto bus routes in place of ageing RTs. History repeated itself once again, as large numbers of the more sound vehicles were purchased by London Transport - and RMCs were common on training duties for many years. The last crewed working in the Northern area, 347/347A (a route I had travelled often as a 'Rover') lost its RMLs in September 1979. The last Routemasters were operated by London Country in February 1980 - the very last was RMC1512 as a substitute for a broken Atlantean.